Potassium is an element that contributes to tons of benefits towards the body. It can help lower sodium levels, help you avoid muscle tension, and even lower your blood pressure! Although potassium is in many foods, it is said that many people don’t get as much potassium as they need for each day – however it is also possible to have too much, in case of certain conditions. The required amount would be 4.7 grams every day, but if you’re a training athlete, you might need a little more more. Many people know that bananas are a great source of potassium, but there are many great potassium sources out there. Surprisingly, there is a whole slew of different vegetables and milk products that can give you even more potassium than a banana can. Let’s take a look at some of the foods that are not only filled with potassium but also have several different kinds of benefits to the other parts of your body. Although the “Popeye” tale about spinach being super-rich in iron was a famous scientific mistake, our lovable spinach-eater actually wasn’t fooling when he said his favourite snack could make him strong. Since potassium helps keep muscles from cramping by lowering lactic acid, it’s no wonder why this vegetable is in top athletes’ diets. A single cup of cooked spinach has a whopping 839 mg of potassium. Not only that, spinach is jam packed with antioxidants that can help combat different kinds of cancer such as ovarian and prostate. By just having a cup of spinach added into your diet each day, you’ll be giving your whole body a treat. All beans in general have great potassium content, but white beans have an especially high number per cup, plus there are tons of delicious ways to cook them. White beans, per cooked cup, contain 1004 mg of potassium. White beans are also a great substitute as they are high in protein and also do not increase your blood sugar level, meaning you will get fewer cravings and also lowers your risk for heart disease. So cook up some of these in a vegetable stew or nice soup and chomp away to a healthier diet. This miracle fruit isn’t just something we put in our guacamole anymore. Avocado is one of the most vitamin rich fruits, and it is also full of potassium. Eating one whole avocado will give you 975 mg of potassium, almost twice as much as a banana. Some health experts suggest ingesting one avocado a day for the best benefits. With that, you will also gain defense against oral cancers and strokes. If you’re not sure how to eat your avocado, you can try making a fruit shake of them by simply adding milk and shaved ice in a blender. Believe it or not, tomato sauce is actually a great source of potassium. Mix it in with your favourite low fat pasta and you’ll be getting 909 mg with every cup. Be careful, however. Use your smart shopper skills and check the label. If you see an alarmingly high amount of sodium or sugars, don’t buy it. Pick those that are almost purely tomato sauce and combine it with a good low fat pasta noodle. By picking the right kind of tomato sauce, you’ll not only get potassium but Vitamins A and C plus lycopene, which is a great antioxidant. Better still – use fresh tomatoes and make your own! When you hear the word ‘potato,’ you might be reminded that it isn’t the healthiest food out there. But that’s only when you cook it in such a way that other factors like oil or salt is added in. The baked potato, however, has lots of surprising health benefits, and one is its potassium content. One whole baked potato has 925 mg of potassium, and if you enjoy its cousin, the sweet potato, that’ll give you 694 mg. The potato may be considered as “The Devil’s Food” by some, but with the right cooking (i.e baking), the potato can provide not just potassium but also fibre and a way to lower cholesterol. All you have to do is pick and cook them wisely. Of course we couldn’t have this list without the banana. Probably the biggest reason why bananas are regarded as the most popular source of potassium is that it’s very accessible and tasty. Bananas are a very versatile fruit as well so you can put them in a healthy shake, cook them, or just eat them on their own. You’ll also get great heart and hair benefits from bananas too. An 8 ounce glass of milk has 322 mg of potassium plus a lot of other great vitamins and of course, calcium. If you think that whole milk isn’t a good option, especially if you’re on a diet, note that 1% milk will still give you the benefits you need, without the extra calories. But not just your regular yogurt, the fat free kind. You may know that yogurt is a great substitute to ice cream when it comes to milk products. And since yogurt is made of milk, you’d suspect correctly that it has high potassium content. You’d be surprised though that it actually has more. One cup of fat free yogurt has 579 mg of potassium and help you with digestion, plus there are studies that say yogurt can help prevent osteoporosis. The 100% pure kind! Orange juice is a favourite at breakfast or during snack time, but if you don’t drink it as much, you really should. Orange juice with give you 495 mg of potassium for every 8 ounces, which is quite a bit for just a glass. It is also a very healthy dose of Vitamin C which is great for your skin. The beauty of 100% orange juice is that even the kids will enjoy drinking it, so you won’t have to put so much effort into persuading them to make the healthy choice. This great snack food is not only tasty, but packs a punch when it comes to potassium. For just a quarter cup, you’ll get a whole 250 mg of Vitamin K. Instead of sugary snacks or chips, you can instead turn to raisins while you’re watching TV, or in the lunch box, or even after a workout for an extra boost. From raisins, you’ll also get fibre and antioxidants that will help you fight against cancer. You might have noticed that almost all of the above-mentioned fruits are probably fruits or vegetables or something that tastes like the sort. So, here’s something to spice things up a little bit. If you’re low on potassium, then stave-off the food boredom and add fish into your menu. Try adding grapefruit to your broiled salmon. This would be a delectable, healthy and home-cooked meal that would really give your body the additional nutrition it needs. If you’re the type of person who loves salads, then you can easily incorporate mushrooms into your daily diet. Different variations of mushrooms can provide you with lots of minerals, one of them namely potassium. Just a cup of these can already give you 28% of the daily recommended value. No. These aren’t the ones that have pearls in them, just to clarify things up. Instead of pearls, they contain lots of health benefits. Clams are rich in omega 3 fatty acids which makes them good for the heart. They are also rich in Vitamin A which is essential for glowing skin and proper vision. The protein contained in clams is even higher than that in red meat, plus it provides a bonus for having lower calories. 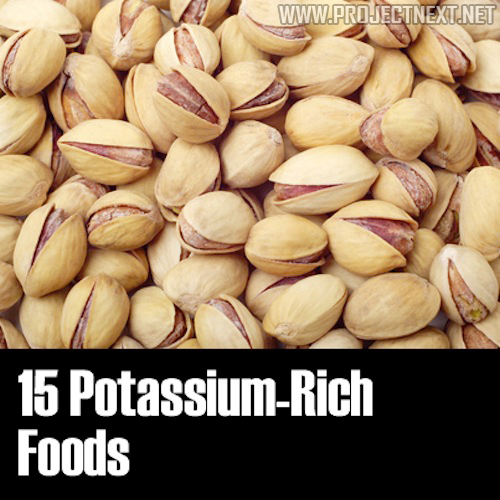 It is also one of the foods that can be included in diets for potassium deficiency. Where do I even begin with the numerous uses of this fruit? Besides from being one of the richest sources of potassium, papaya is also known for its other medicinal uses. It is used as folk medicine, anti-inflammatory and laxative. Even whitening soaps have papayas as their main ingredient. One papaya contains 718mg which is equivalent to 16% of the daily value. Besides being an all-time favorite snack, pistachios are also a rich source of potassium. Just a cup serving can give you 8% of the daily value. But this isn’t the only thing you can benefit from eating pistachios. These nuts are also high in vitamin B6, which has numerous effects on the nervous system. And it doesn’t stop there. Pistachios also promote better skin health because of its vitamin E content. Potassium is not something to be overlooked in a diet. The best thing about these foods are that they’re very accessible, fun to eat, and packed with flavour, so they doesn’t get boring to eat. You can experiment with them in other healthy dishes and pick out your favourites for just the right amount of potassium each day. By just introducing a few of these in your diet, you’ll be getting all the benefits that will help make a healthier you. Great read! I’m highly allergic to bananas, so I was looking for alternatives to that nasty fruit.